In math and science, the constant is a term that denotes a certain value such as ‘π’ which is a practical name for the number 3.14159. Java has its kind of constants. These are variables that under (a) do not belong to any object and sub (b) do not change their value once they are set. The static word in the variable declaration shows that the variable does not belong to any object. There is a similar keyword that says that the variable value will only be set once and will not change. This is the keyword final. This keyword is not limited to static variables but can be used with instance variables, local variables, and even with variables that are parameter methods. By declaring the variable as a final, you show to everyone that the variable during the existence will have the same value. More importantly, the compiler will detect every attempt to change the value of a so-declared variable and report it as a mistake. As for the Java terminology, the variable that is declared as static and final is called a constant. The final modifier can be used in several places in the Java programming language. Here we will cover its most common usage. The final modifier can be applied to the declaration of a local variable, function argument, and non-static or static member variables. In this context, the variable modifier converts to a constant. The translation language translator will check if some code is attempting to modify the value, and such attempts will be flagged as an error. Here’s an example. We can apply the final modifier to the declaration of function. The function marked with the final can no longer be overruled – that is its final implementation. The abstract methods cannot be declared final – the fact that they are abstract means they lack implementation; it certainly can not be their ultimate state. Here’s an example. One of the finite class examples is the java.lang.String class – it is finite so no one could inherit it and thus gain access to its member variables. Static variables do not belong to particular instance of class. Static variables belong to the class itself and in memory there are only one location, regardless of the number of copies of that class that are created in memory. Non-static variables belong to class specimens – each instance of the class has its own copy of such variables. Static variables belong to class – the class in memory keeps the values ​​of such variables; all sample classes therefore see the same content so we can consider static variables to be shared between all class sizes. By updating the value variable, the new value will be automatically visible to all instances of that class. Static filter can be applied to any element legally declared within a class. In the case of membership variables, the consequence is that such member variables will be stored in memory only in one place. What happens if it is a method? By declaring the method as static, the message is the same: the relevant method does not belong to classes of classes but to the class itself. Consequently, static methods will not receive a hidden reference to the object over which they are called upon the call; in static reference methods this is unavailable. Indeed, invoking static methods across the object is equally confusing as accessing static member variables by referring to this reference: in both cases, it is better to simply write the name of the class, the point, and the name of the calling method. Static stands for a variable that is common to all objects that instantiate a given class while final defines the constant. 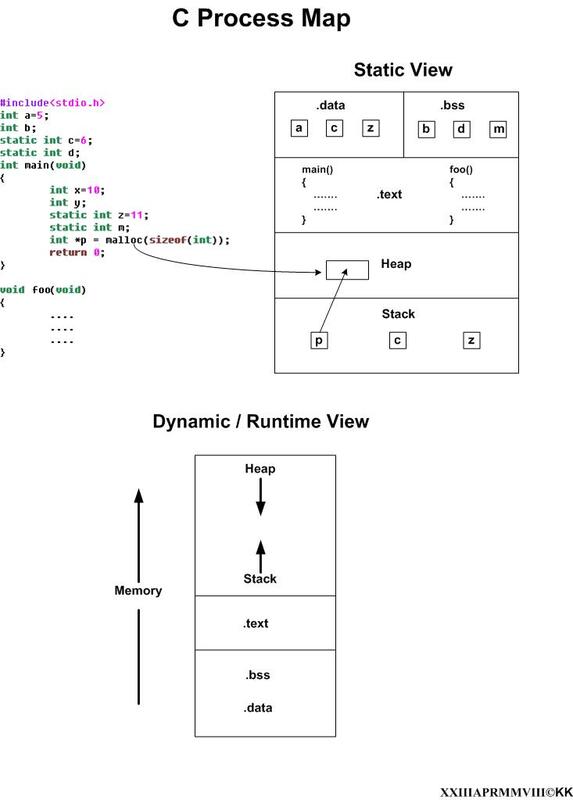 Static is a method that is the same for each object given class – is also called class member e.g. such is the main method. Final method cannot be processed in the inherited class. The final cannot be expanded i.e. does not allow subclasses. Static does not apply to class. To put it simply, final denoted that the value cannot be changed (override). Static value is set to its default value, but can be reinitialized. The key work static provides access even when there is no object (instance). Prominent classes are declared through the key word static. If you do not want the value of some changes later in the program to go, or if you want the compiler to check and forbid, you can change that promise to the final. There is a static block for the initialization. The static block for the initialization is declared as the key static in front of the brackets. This kind of block is performed once, during the classes reading, and it usually initializes the static members of the class. Emilija Angelovska. 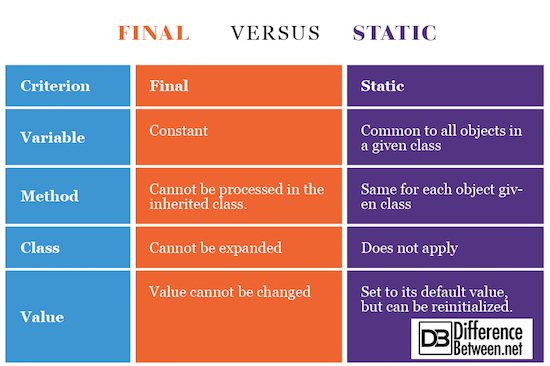 "Difference Between Final and Static." 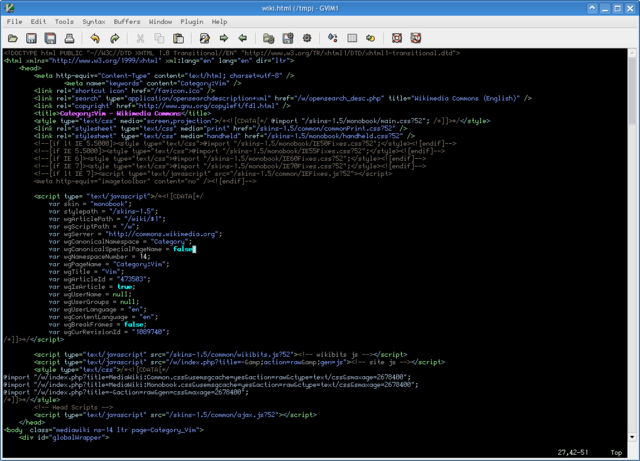 DifferenceBetween.net. May 22, 2018 < http://www.differencebetween.net/technology/difference-between-final-and-static/ >. Maguire, S. Writing Solid Code. Microsoft Press, 1993. Warren Jr, H. S. The Hacker’s Delight. Addison Wesley, 2003. Barnes, D., K¨olling, M. Objects First with Java: a Practical Introduction using BlueJ. Prentice Hall/Pearson, 2 edition, 2005.